Beer Nerd Details: 6% ABV bottled (750 ml caged and corked and covered). Drank out of a goblet on 5/26/12. Well, call me a believer. I just may be coming around to sour beers, though they still don't get me revved up the way a bourbon barrel-aged beer does. 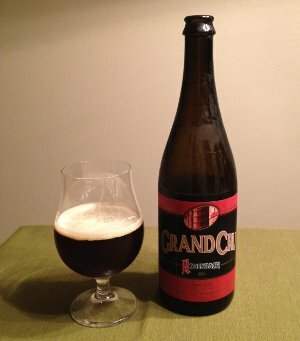 Anyways, I've already got a bottle of the Rodenbach "classic" (similar process, but only 25% is aged, the rest being young beer) in my fridge, though I'm not expecting that one to be quite as revelatory as the Grand Cru! This page contains a single entry by Mark published on July 5, 2012 8:53 PM. YuleSmith Summer Holiday Ale was the previous entry in this blog. The Session 65: One is the loneliest number... is the next entry in this blog.